SACRAMENTO, Calif. — In 1996, California voters approved Proposition 215, the ballot initiative that legalized medical cannabis and planted the roots of today’s verdant Gold Rush. Nineteen years later, on the eve of what now more than ever feels inevitable — legalization of adult-use recreational cannabis in the Golden State — California still has no framework governing growing, processing, testing, transporting, selling or delivering medical cannabis. That may or may not change this week as the Legislature ends its regular session. Two weeks ago, Gov. Jerry Brown gutted three pieces of legislation: two major but disjointed regulatory bills largely favored by law enforcement and mainly opposed by cannabis activists, and one that sought to tax cultivation and apply proceeds to law enforcement and environmental cleanup. Brown floated his own language into all three bills in what’s being called the governor’s remix, a session-closing play by the self-described “brooding omnipresence” and “catalyst for change” that could end nearly two decades of conflicting interpretations and court battles and set the policy stage for post-legalization California. Brown’s Medical Marijuana Regulation and Safety Act proposes the long-overdue framework governing growing, processing, testing, transporting, selling and delivering medical cannabis. Brown’s bill would create the Bureau of Marijuana Regulation within the Department of Consumer Affairs; classify cannabis as an agricultural product that can be labeled organic; classify edibles as unadulterated food products with testing and labeling standards; and removes Los Angeles dispensaries from a controversial exemption while giving city and county governments authority to ban dispensaries. Brown’s version retains penalties for rogue doctors providing medical cannabis recommendations; includes labor rights for industry workers; but strikes a labor-inspired apprenticeship program for cannabis industry workers. Lawmakers now have until Friday to reconcile AB 266, SB 643 and AB 243 with Brown’s remix. Or Brown could call a special session, as the former Jesuit seminarian did last month to pass a controversial right-to-die bill while end-running a powerful committee that largely agrees with the Catholic church’s lobbyists. Special parliamentary rules also being applied could push the session past Friday’s deadline for floor votes. The 77-year-old four-term governor has been skeptical, even snarky, about the prospect of legalization. Brown’s stance on medical cannabis is as nuanced as the governor himself. This summer, Brown signed legislation prohibiting hospitals from denying organ transplants to people based on their use of medical cannabis. Last year, Brown’s office pushed the Cannabis Cultivation Initiative, which led to new cultivation regulations being introduced by regional water-quality agencies serving California’s North Coast and Central Valley. Brown’s current intervention is both the action of an artisan political sausage-maker and the craft a sage statesman saving his own bacon. Passing historic cannabis policy today would correct California’s shameful lack of regulation and would burnish Brown’s legacy in his final two years as California’s most interesting governor. It’s now been nearly 20 years since California legalized medical cannabis, and five years since the state’s last legalization initiative, the ill-fated Prop. 19, failed. Californians will vote on at least one legalization initiative 425 days from today. It’s too late to say the Golden State leads anymore — a sore point among long-time California cannabis crusaders who watched as four other Western states legalized cannabis. Brown himself has said he’s looking to Colorado and Washington for guidance. The next step California takes toward regulating medical cannabis may be one step closer to the sensible cannabis policy that inevitable legalization requires, or another toke short of the line. Clarification made Sept. 10, 2015 at 2:14 p.m.: Gov. 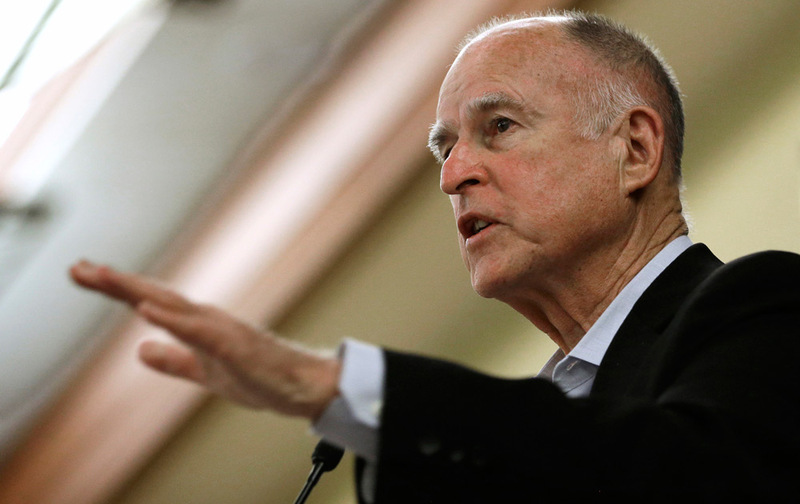 Jerry Brown’s proposed changes to legislation are not official amendments to the bills.